The weather has quickly turned frigid! But while some may choose to let the winter doldrums get the best of them, our county has moved on just as quickly to kicking off the holiday season. This weekend in Hendricks County, Indiana, is packed with open houses, shopping, celebrations and just plain fun gatherings. Don’t let the winter blues get you down. Make this the weekend you choose to start a new holiday tradition! The Christmas tree lightings have begun! Come kick off the holiday season on Danville’s historic Courthouse Square. This event will feature the best parts of Christmas: Santa and Mrs. Claus, roaming Christmas characters, a trackless train, cookie decoration (with help from members of the Danville Christian Church) and a live nativity presented by Danville Methodist Church. Visitors also can enjoy caroling by the Treblemakers, the Danville Fire Department’s famous chili and hot chocolate thanks to Danville Kiwanis. If that wasn’t enough, there will be an Extreme Slide on Marion Street and, thanks to Wright Realtors, a giant snow globe that’s perfect for family photos! Come on out from 4-8 p.m. Friday to enjoy the perfect event to ring in the season. Growing up, one of my favorite Christmas traditions was driving around the area with hot chocolate and looking at Christmas lights. 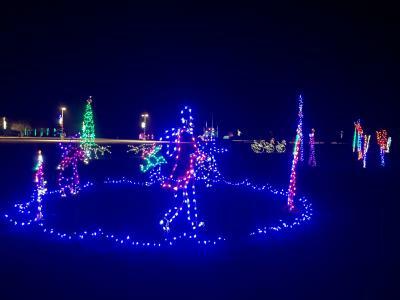 Well, you can enjoy a whole lot in one place at the Winterland Holiday Light Display at Ellis Park, 49 N. Wayne St. in Danville. This display is an annual tradition, yet there are a few new additions this year, including the 12 days of Christmas, fishing penguins, the Colts horseshoe and two custom arches. This drive-through experience opens Friday following Christmas on the Square and will recur nightly through Dec. 28 from 6-10 p.m. Cost is $5 per carload Monday through Thursday and $10 Friday through Sunday. Winter and Christmas just aren’t the same without some ice skating. So, the Avon Ice Rink is back for a second season, and it’s bigger and better than ever now with bumper cars! You read that right: bumper cars! How cool is that? The synthetic ice rink is located at Washington Township Park, 435 Whipple Lane in Avon, and opens for the season on Friday. Its weekend grand opening celebration will continue through Sunday. For more details including hours and cost, click here. 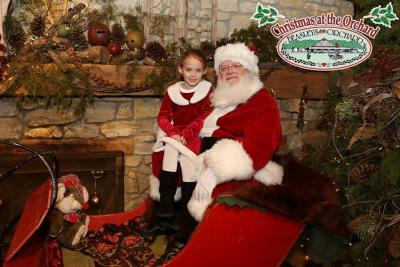 Enjoy a traditional visit with Santa Claus in Avon. Reserve your spot here to visit Santa Claus in his shop at Red Curb Theatre, 8403 E. U.S. 36 in Avon. This first-time offering costs just $5 and begins from 4 to 7 p.m. Friday and continues through the weekend with times available on both Saturday (10 a.m.-3 p.m.) and Sunday (noon-5 p.m.). Have professional photos taken with print packages available for an additional fee by Adrienne Nicole Photography. Photos will even be printed while you wait. Visitors also can enjoy holiday treats. Ever wanted to take advantage of Small Business Saturday but not sure how or when to shop? Why not go on a group shopping tour? Two buses will leave the Kmart parking lot in Brownsburg at 9 a.m. Saturday and visit various small businesses in Hendricks County. Cost is $30 a person and includes a swag bag with goodies, a light breakfast, lunch and drinks. Tickets must be purchased in advance to reserve your spot. Click here for more information. Nothing says Christmas quite like a visit to Beasley’s Orchard during the holidays. With their 150-year-old, Civil War-era barn market decked out in Christmas decorations, a roaring fire in the stone fireplace, the smell of baked pies and cookies and of course St. Nicholas himself in his antique sleigh, ready to get those Christmas lists from the little ones…well, let’s just say this event can’t be topped! The final weekend of this annual tradition occurs from 10 a.m.-2 p.m. on both Saturday and Sunday. Visiting Santa during the event costs nothing. However, a beautiful unique family photo setting with professional photos will be available as an option. This event will take place at Beasley’s Orchard, 2304 E. Main St. in Danville. While we always try to include the kids on all the Christmas fun, sometimes adults just want to have some adult fun! Enjoy bumper cars and brews on the ice for an adults-only night from 7-9 p.m. Saturday at the Avon Ice Rink, 435 Whipple Lane in Avon. This 21 and up event is $15 per person, and Indy Beer Taps will provide all adult beverages. Tickets include unlimited bumper car rides, a free drink ticket, a sweet treat, fire pit access and a snow globe photo opp. Purchase tickets here. Want to shop for Christmas and support local businesses at the same time? Come out to the 2nd Annual Holiday Market at the Hendricks County 4-H Fairgrounds and Conference Complex, 1900 E. Main Street, Danville, from 2-5 p.m. on Sunday. There will be local farmers, producers, food-inspired companies, artisans, bakers and direct sale vendors for a fun start to your holiday shopping. Cost is free. Between Santa Claus, Christmas lights, and holiday shopping, Hendricks County has you covered this weekend! If you are looking for things to do anytime, make sure to check out the Visit Hendricks County Events Calendar.